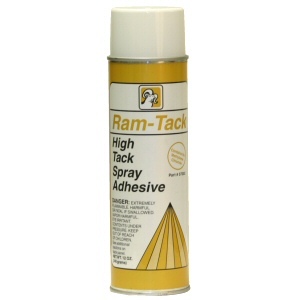 Ram-Tack High Tack Spray Adhesive is an affordable alternative to the 3M Super 77 Spray Adhesive that we often recommend for attaching our burlap fabric to Owens Corning 703 or Owens Corning 705. With some simple testing we found that Ram-Tack works very well, at a significantly lower cost. See our FAQ on attaching fabric to rigid fiberglass board for more details. Here’s a link to the manufacturer’s MSDS sheet for Ram-Tack. Note: Due to air shipping restrictions, this item can only be shipped via regular Ground shipping, and only to the lower 48 states. Currently ships within: 1 business day. Special quantities? Bulk quantities? You name it! Just give us a call toll-free at 1-866-787-7881. 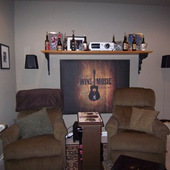 I was able to install the 11 acoustic panels yesterday, and they help a great deal. I wish all American companies shared your values. I thank you profusely, Cynthia, on a personal level for all your help, professionalism, and to ATS for making a good product with reasonable prices.